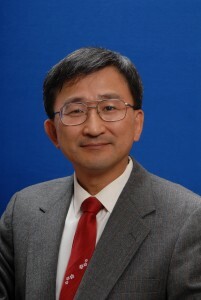 AME Professor Dr. Feng C. Lai was appointed as Associate Editor of the American Institute of Aeronautics and Astronautics (AIAA) Journal of Thermophysics and Heat Transfer. Dr. Lai’s term will begin immediately and last through December 2017. As an Associate Editor, Dr. Lai will have the unique opportunity to serve his fellow engineers and scientists in the field of aerospace. In September 2014, Jonathan Meyer, David Miller, Robert Huck and Austin Lee participated in Tulsa Flight Night. Tulsa Flight Night is a Science, Technology, Engineering and Mathematics (STEM) fundraiser for the Tulsa Area. For the event, the OU team created an autonomous quad-copter dance act. This involved two quad copters flying in a 20×20 foot area, moving and adjusting lighting in coordination with a musical piece selected by the event. The system utilized a downward looking camera from each copter that tracked a lighted target on the floor. Size, frame position and frame orientation of the target image, when combined with information from the copters inertial system (gyros and accelerometers) allowed the autonomous system to calculate the copters position, orientation, pose and make the proper adjustments to carry out a pre-choreographed dance. This was new work done over the summer for a complete budget of under $25,000. The work was done by recent AME M.S. graduate, Jonathan Meyer. David Miller is an AME Professor, Robert Huck is the Director of Applied Research and Unmanned Systems and Austin Lee is an Electrical and Computer Engineering M.S. student. To view the encore of the even held in Felgar Hall 300, please click here. As the School of Aerospace and Mechanical Engineering continues to grow, the faculty and students keep things exciting with great accomplishments and honors. We want to recognize some of the recent accomplishments with AME kudos’. Arun Balakrishnan, Ph.D. candidate in Aerospace Engineering, (Faculty Advisor: S.R. Gollahalli) for receiving a Robberson Conference Presentation & Creative Exhibition Travel Grant in the amount of $500. Juan Felipe Correa Pugliese, M.S. candidate in Mechanical Engineering, (Faculty Advisor: Wilson Merchan-Merchan) for receiving a Robberson Conference Presentation & Creative Exhibition Travel Grant in the amount of $500. 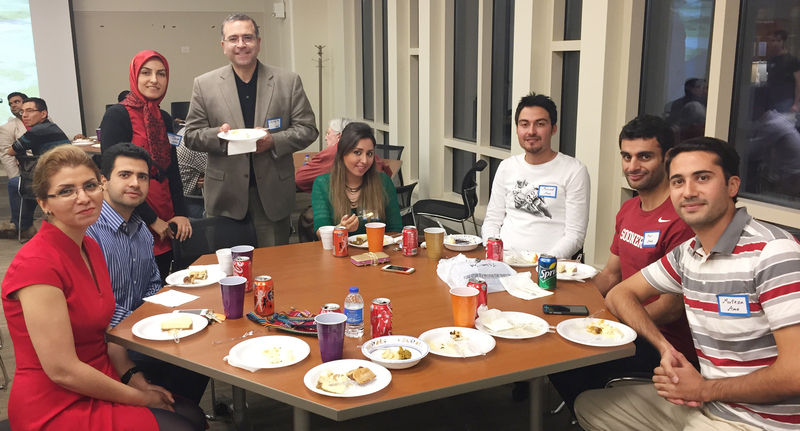 The School of Aerospace and Mechanical Engineering Graduate Student Community (GSC) hosted an International Food Festival on Friday, October 3, 2014. 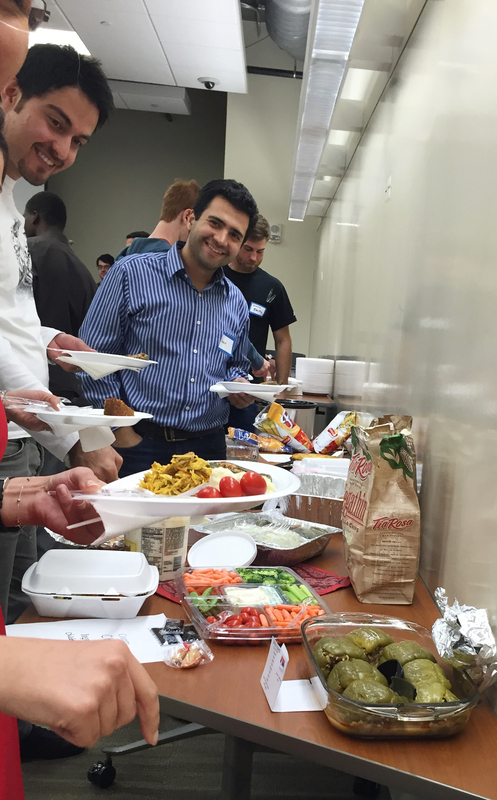 The event was open to AME graduate students, AME faculty, other graduate students and families. 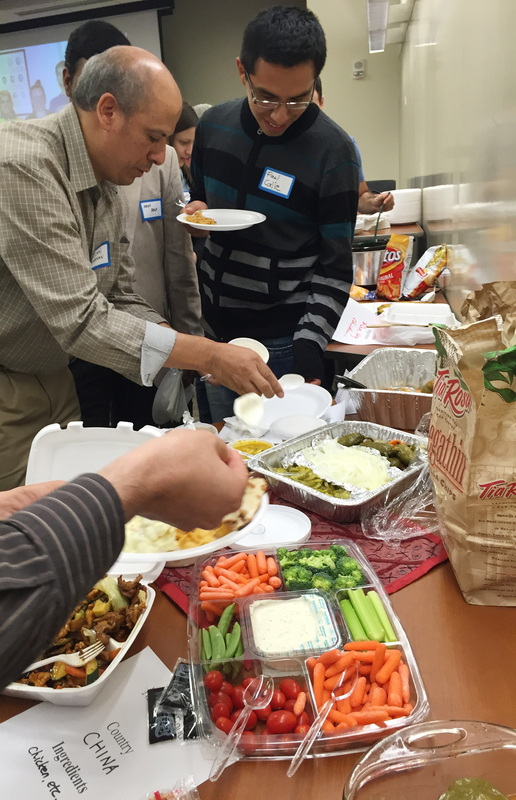 Attendees were encouraged to prepare an ethnic dish from their country to share. It was also requested that they record the name of the dish, the country it originated from and the main ingredients for all to see. 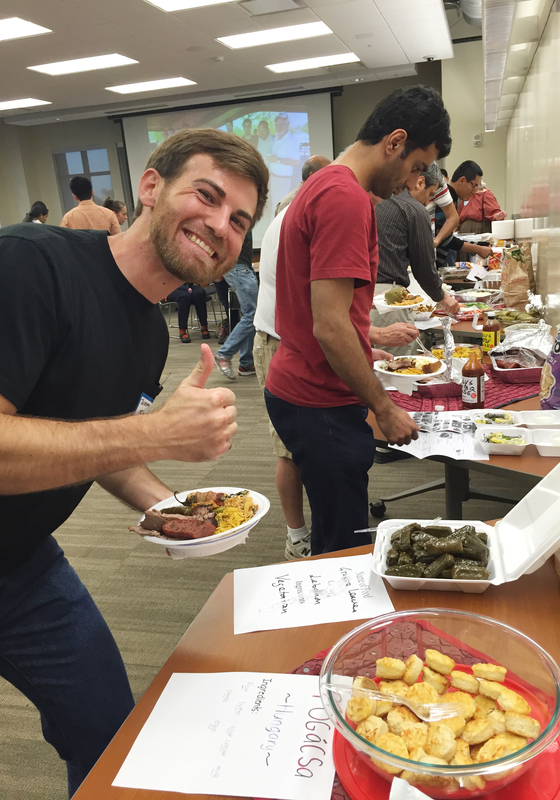 Over 40 people attended the International Food Festival from 10 different schools from OU. Eight of those 40 attendees were professors. There was over 20 different ethnic dishes from 10 different countries including Iran, India, Nigeria, Turkey, Hungary, Serbia, China, Lebanon, Thailand and the United States. Overall, the event was a success and the GSC continues to grow in size and expand their list of activities. For more information regarding AME GSC, please contact Oluwaseyi “Seyi” Ogunsola at oogunsola@ou.edu. Ashley Carpenter, Aerospace Engineering Senior and ROTC Naval student, accepts the Cotton Bowl football from OU Football Coach Bob Stoops to begin the trek to Dallas. A battalion of OU Naval ROTC students started their trek to the Cotton Bowl in Dallas early Wednesday and expected to reach Ardmore by nightfall. 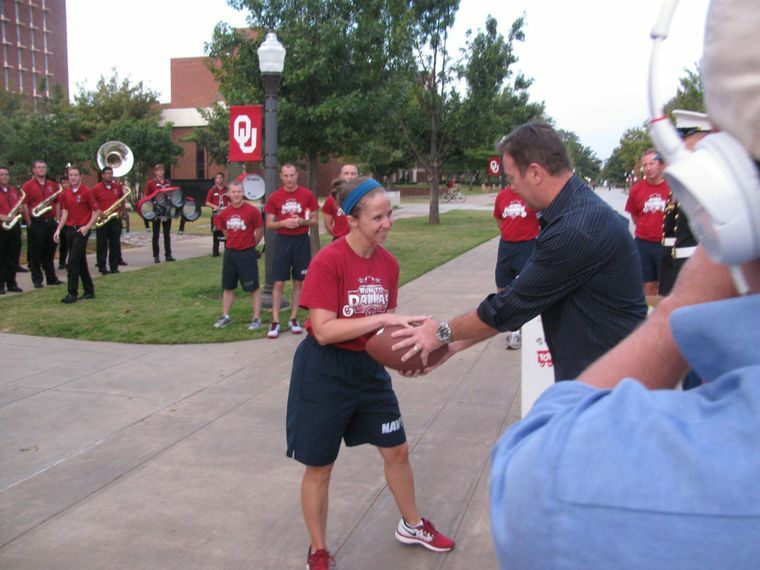 OU Football Coach Bob Stoops handed a football to Battalion Commander Ashley Carpenter as she began the run down U.S. 77 toward Dallas. They expect to meet up with counterparts from the University of Texas on Friday morning and then play a game of flag football. Midshipman Michael Allen, a Flower Mound, Texas, junior and the battalion’s student public affairs officer, said teams will run in shifts during the daylight hours. Approximately 80 students will take part in the annual run. Lean Cell Advising at AME begins today! Lean Cell Advising is what we like to call students’ one-stop-shop for efficient advising. 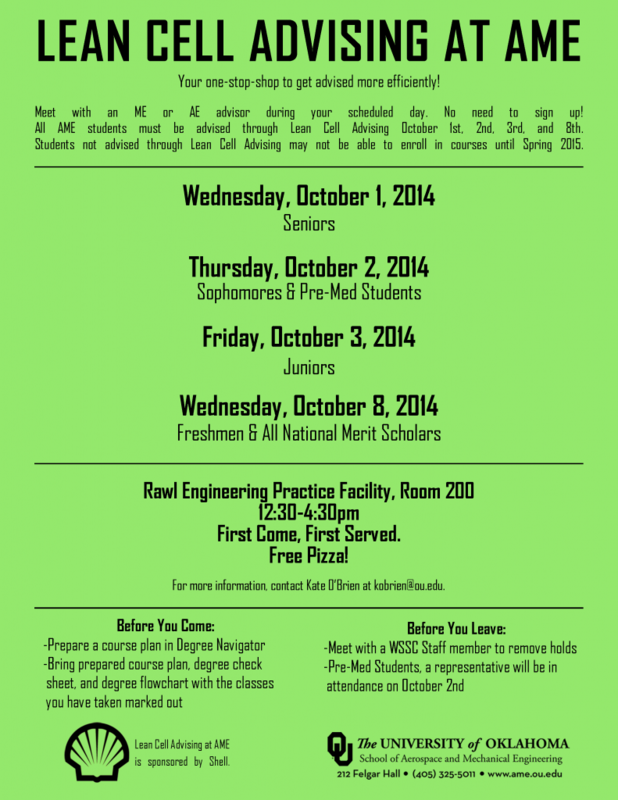 Students will meet with a Mechanical Engineering or Aerospace Engineering advisor during their scheduled day. There is no need to sign up as students will be advised on a first come, first served basis. All AME students must be advised through Lean Cell Advising October 1st, 2nd, 3rd, or 8th. Students not advised through Lean Cell Advising may not be able to enroll in courses until Spring 2015. All advisement sessions will be held in REPF 200 from 12:30-4:30pm each day. Pizza and drinks provided. For questions or more information, please contact Kate O’Brien at kobrien@ou.edu.